Don Walker: “I am going to get criticized by a lot of people who say I don't know what is going on." 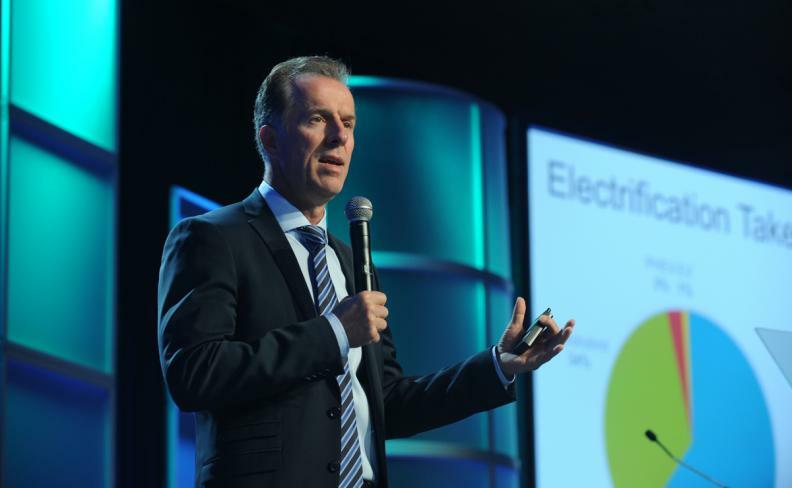 TRAVERSE CITY, Mich. -- Automakers are overstating the market potential of electric cars and the timeframe of when self-driving vehicles arrive, charged Don Walker, CEO of Canada's Magna International. Speaking at the CAR Management Briefing Seminars on Wednesday, Walker took issue with some current industry assumptions. Some estimates say electric cars could account for as much as 25 per cent of the market by 2025. Walker warned that the number will be dramatically lower. Battery powered electric vehicles, he predicted, will account for only between three and six per cent of the total global vehicle new-vehicle market by 2025. It could come closer to six per cent if the Chinese EV market grows quickly. The Chinese government has required automakers to build more electric vehicles to combat air pollution. “I am going to get criticized by a lot of people who say I don’t know what is going on,” Walker said. “Quite frankly, auto companies can’t tell publicly what they really believe," he said. "They know what's going to happen, but they have to say what is going to be popular [in order] to be perceived as a progressive company to be in-market. He also said the race to autonomous driving is getting oversold. Although automakers will continue introducing more technologies that enable vehicles to drive themselves, don’t expect Level 5 autonomous vehicles for at least another decade, he said. “A full autonomous vehicle is a long way off for lots of reasons, because of legislation, class action lawsuits, all the complexities and the costs associated with it,” Walker said. Some automakers have been telling the public self-driving vehicles will arrive as early as 2021. But Walker displayed a slide forecasting the technology for 2025. Cars with no autonomous features will still account for 17 per cent of new-car sales in eight years, while level 1, 2, or 3 autos, which still require human involvement, will account for another 79 per cent of the fleet in 2025. Level 4 cars, which can drive themselves without human intervention, will account for just four per cent, Walker predicted. “Level 5 cars are not even a sliver on that slide,” said Walker. A Level 5 car likely would dispense with a steering wheel, a brake pedal and other controls. Despite the technology still being years away, Walker said Magna is fully onboard with it. Magna expects to grow its autonomous-related business from US $450 million in sales of components and technologies today to US $1 billion by 2020. “It’s all coming and no one is going to stop that,” he said. He said Magna is investing in nearly a dozen new technology companies and is consulting with future technology experts at universities as it maps its future.